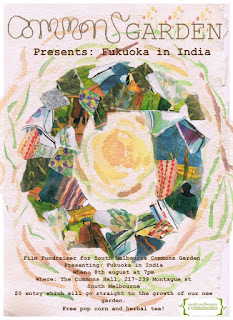 The South Melbourne Commons is proud to announce that we will be hosting a film fundraiser event for the Commons Garden. Masanobu Fukuoka in his film 'Fukuoka in India' shares with the viewer the philosophy and techniques from his revolutionary farm in Japan, before embarking on a tour of India, traveling to a number of farms and villages. Join us in seeing this rare footage, which includes a demonstration of Fukuoka's unique clay ball strategy of broadcasting seeds and growing rice. Cost: $5 entry, which includes free popcorn and herbal tea!